Just announced from the Pokemon Nintendo Direct! Gen. 6 is actually here! 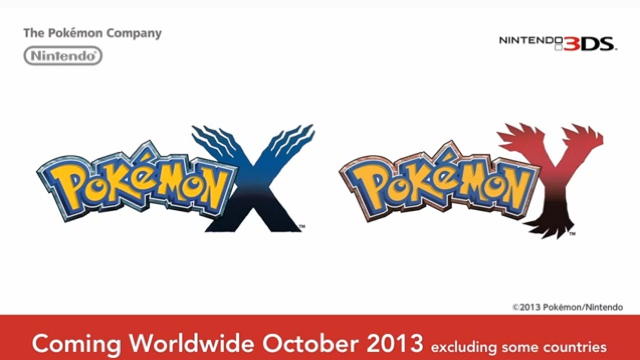 A worldwide October 2013 release is set for Pokemon X and Y on the 3DS! Yet a little in awe that Gen. 5 is already coming to a close. Bah, thought I'd quit gaming, but I'm only alluding myself. It looks good, the Battle scenes I mean. A bit worried about the overworld though, but I'm sure nine months is enough for some polishing. The last Pokemon game I've played was Yellow, think now's a good time to jump in the Poke Wagon. Will definitely get the version with the Legendary bird. 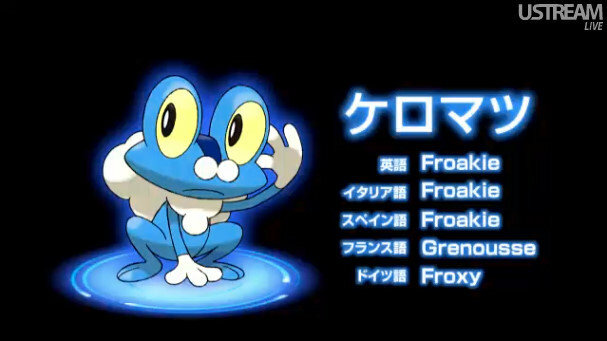 Yeah, definitely going with Froakie, Bet he'll be busting up an ace beard once he's fully evolved. Interesting use of letters for the version names. Then again, there's only so many colors. The question is: Pokemon Z or Pokemon X2 and Y2? I said I'd be happy as long as the next game was on 3DS. I didn't lie. My only criticism would be that the Pokémon designs look a little bit "complex" this time, which I hope doesn't become a trend, but I'm sure I'll get used to that. I'll likely be going with Chespin. I'm sure this will be an amazing game and it also looks a lot more free in the overworld which will be wonderful, so props to Gamefreak. I'm looking forward to seeing more of this in the future. And did I mention simeltanious worldwide release? If you can't tell from my fennekin( I think) avatar, I'm pretty exited for this. And I guess around 100 new 'mon in this generation. I am so freakin' excited, I havn't been excited for a new pokemon since Diamond & Pearl and you know why? because Gamefreak were rehashing the series up until black/white/black2/white2, I just hope I don't have to import pokemon from the latest games because I haven't even laid a finger on them. Can you believe it's taken GameFreak 16 years (this is including the Jap release of Red & Green) to make a proper full 3D Handheld Pokemon RPG? Well it's about time and for the right console! OMG Squee! This is gonna rock!! I'M SO EXCITED!!! This looks amazing. The starters are definitely the weirdest looking yet though. Yet, I kind of like all of them. Sort of leaning towards Foarkie right now. I think I'm going to go with Chespin for my starter. So what's going to be strange, is there's a big chance we might not know the whole Pokedex before the game comes out like all the others. Discovery! I wonder if we can run diagonal yet. It didn't look like it. Graphics look a bit bad but all 3DS games do in 2D. Most wanted 3DS game now. It looks a little odd, I wonder if there were any other major changes aside from the graphics. I'm getting Froakie and the deer legendary. Seriously, this new generation is looking amazing so far! The X-version and Fennekin it is! I'm going for Pokemon X. I will most likely choose Froakie! For having one Pokemon game, I watched the trailer and actually thought it looked good! So who knows, maybe I'll indeed get this. I thought I was done with pokémon. Glad I'm not finished with you yet.